Ali'iolani Hale, completed in 1874, was the home of the Hawaiian Legislature in the days before annexation. In January 1893, the planters staged an uprising to overthrow the Queen. At the same time, they appealed to the United States armed forces for protection. Without Presidential approval, marines stormed the islands, and the American minister to the islands raised the stars and stripes in Honolulu. The Queen was forced to abdicate, and the matter was left for Washington politicians to settle. By this time, Grover Cleveland had been inaugurated President. Cleveland was an outspoken anti-imperialist and thought Americans had acted shamefully in Hawaii. He withdrew the annexation treaty from the Senate and ordered an investigation into potential wrongdoings. Cleveland aimed to restore Liliuokalani to her throne, but American public sentiment strongly favored annexation. This website about Ali'iolani Hale, home of the Hawaiian legislature from 1874, offers a history of the building, including details of Wilcox's rebellion in 1887 and the establishment of the Republic of Hawaii. Illustrated. 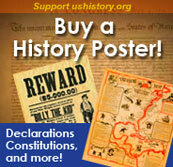 In 1893 Americans living in Hawaii overthrew the existing government, and American troops supported the coup. Hawaii became yet another trophy of the Age of Imperialism. This site tells the story with some pictures and links to key players and events. Be sure to check out the "Apology Resolution" passed by Congress and signed by President Clinton 100 years after the event. 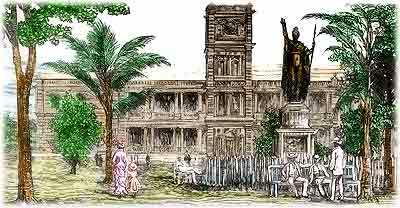 Iolani Palace, built in Honolulu by King Kalakaua, was the last official residence of the Hawaiian royalty family. This webpage offers a history and description of the bulding. In an effort to halt the spread of leprosy through the islands, King Kamehameha in 1850 designated Kalaupapa, on the north shore of Molokai, as a colony for those who fell victim to the disease. This webpage tells the story of the colony and the work of Belgian missionary, Father Damien, who devoted his life to caring for the sick there. The story of the Kalukalu Homestead is told on this webpage by the Kona Historical Society. It describes the settlement in 1850 by an English adventurer who, in a fairly typical fashion, brought many changes over a very short period of time. Illustrations.